Stolpersteine are a privately funded art project and memorial to the victims of the Holocaust. 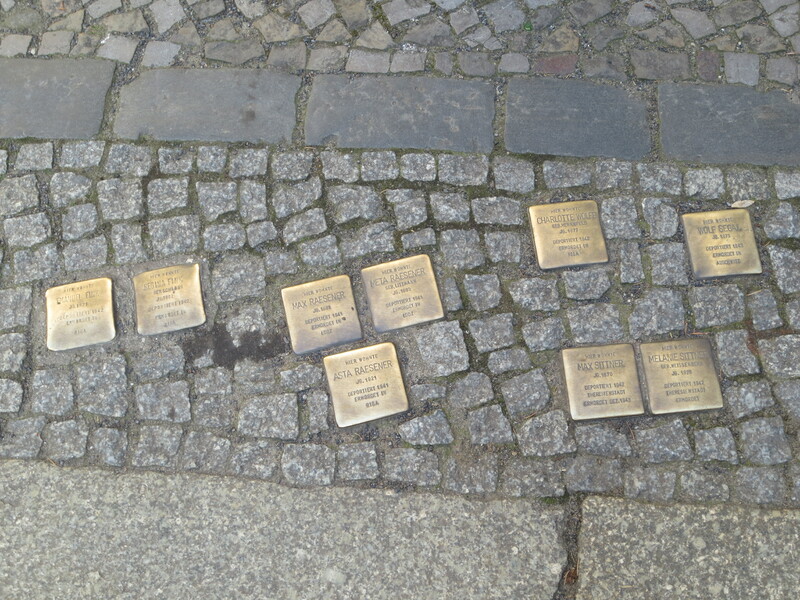 They are golden cobblestones inscribed with individuals’ names and birth and death details, placed at the last location the person chose to live. There are more than 40,000 in Europe, but there are just 25 in Munich, all on private land. In fact, Munich is the only city in Germany that prohibits Stolpersteine on public walkways. Last night was the first night of Pesach! I spent Wednesday scrubbing my kitchen and oven, and I gave away all my chametz, so I was very prepared. 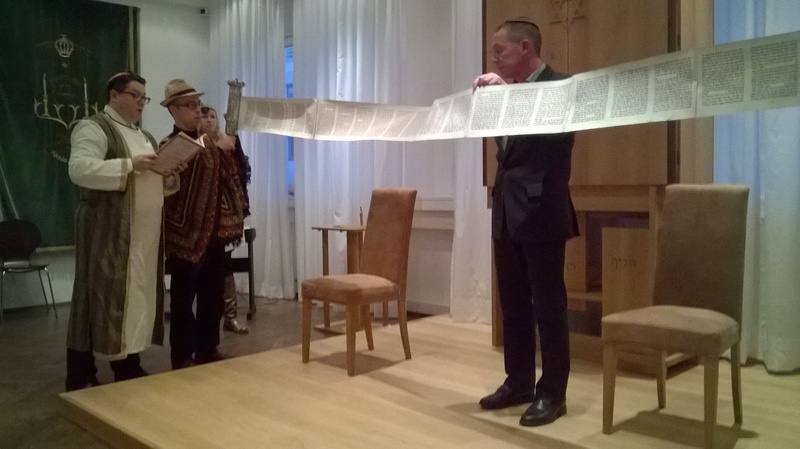 My synagogue held a first-night Seder, and of course I attended. My mom asked me to report back on what was different, but the answer is really: not much. We went through all the prescribed steps. We (well, the children) walked around the room to “cross the red sea”. We opened the door to call for Elijah. We even sang some songs in English (like the song about the four children to the tune of “Clementine”). The rabbi actually gave me a surprise solo—he asked me to sing “My Favorite Things” with the lyrics re-written for Pesach. It went over well. In traditional fashion, I got pretty drunk on my four full glasses of wine. (I had a bottle to myself, and I finished it.) But I learned that I possess two very important life skills. First, I can still carry on decent conversations in English, German, Italian, and Spanish after a bottle of wine. (We have a very international community at Beth Shalom.) Second, even when I am drunk, I can remember and sing all of Chad Gadya without getting tongue-tied. No one else was singing Chad Gadya, so it ended up being a second, unsolicited solo, but at that point I was too tipsy to care. 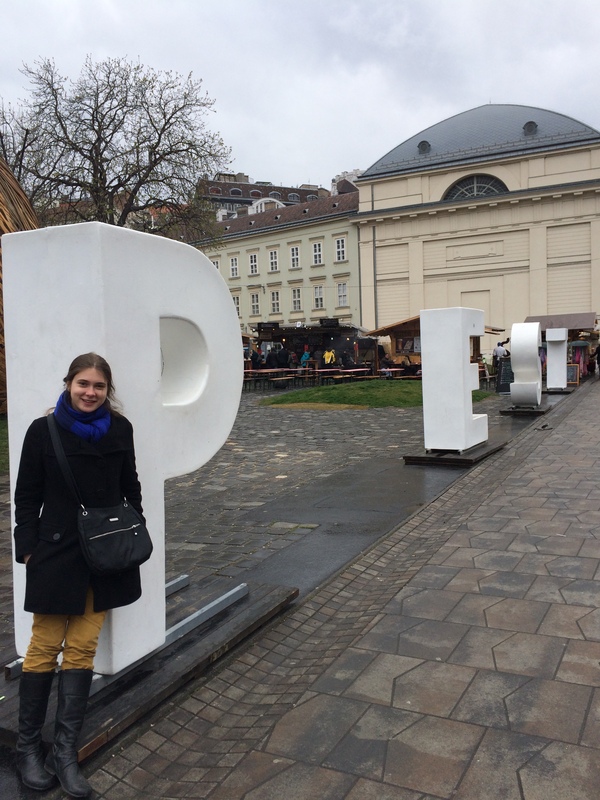 After five days in Budapest, I find it hard to decide what I most associate with it. It’s different from almost any other major city I’ve visited. Part of the problem is that the city is big—Buda and Pest are each rather sprawling, so put them together, and you have a lot of city. But it’s a lot of awesome city. The architecture is varied, though in bad repair. The Jewish community is vibrant. The food is delicious and cheap. The nightlife revolves around super-hipster bars in crumbling old buildings. The flea markets are a dream come true. So I guess I’ll just give up any hope of putting this in a logical order, and instead try to talk about everything. Budapest is gorgeous, and the two halves are gorgeous in different ways. Buda is full of hills, with the white Matthias Church (with a very colorful roof) and the surrounding Fisherman’s Bastion sitting atop one of them. Pest is flat, but it has St. Stephen’s Basilica, the extraordinarily intricate Parliament building, and City Park (with a castle). Of course, both sides have lovely views of the Danube, and the famous chain bridge connects them. At approximately the middle of the grant period, all of the Fulbright students in Germany are invited to the Berlin Seminar. This is an annual meeting focused on sharing experiences and discussing important issues in Europe. The German grantees (including students, professors, teaching assistants, performers, and journalists) are joined by Fulbrighters from other countries (I noticed strong presences from Scandanavia, Belgium, the Netherlands, Poland, Spain, and Italy) as well as German grantees who will soon leave for the States. We meet for seminars, discussion panels, and lots of eating and drinking. The four-day seminar was very full, so I’m going to split my experiences into three blog posts: one focused on Judaism-related excursions, one focused on “networking” (the conference itself and the socializing surrounding it), and one focused on general tourism. This is the Judaism post. On our second day in Berlin, we had the afternoon free. Some friends and I grabbed tickets for a hop-on-hop-off bus tour, and one place we stopped was the memorial to Jews killed in the Holocaust. It’s a strange monument—unmarked stone rectangles (which look rather like tombs) rise from the ground, increasing in height. They’re slightly angled, and walking among them is intentionally disorienting. The following day, we visited the old Jewish district. This is full of Stolpersteine—brass “stumbling stones” marking where Jews who were killed in the Holocaust used to live. Many Germany cities have them, but not Munich. 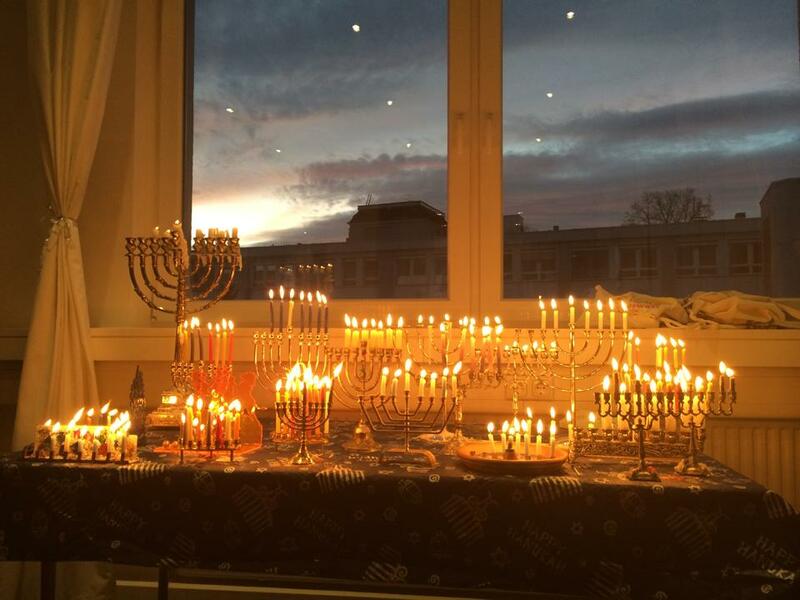 (A member of my synagogue is actually currently working to bring them to Munich.) They’re supposed to serve as a memorial to the dead and a reminder to the living, but I didn’t see that last part working: except for a few tourists, everyone I observed simply walked over them. The best holiday of the year began last night. It’s not the best-known Jewish holiday, but it’s the one where everyone dresses up in costumes, reads a story in the silliest manner possible, eats lots of delicious cookies, and gets drunk: Purim! Today was a holiday-themed day. After singing a Christmas lessons and carols service with my choir in the morning, I browsed in Christmas markets with a friend before heading to Temple Beth Shalom’s Hannukah party. There, I sang songs, listened to stories about Chelm, and ate enough latkes and jelly donuts to last for eight days. (After all, this is the only Hannukah party I get this year!) After the food, the Hannukah party turned into a dance party, and I learned that my friend Jesse (also American, studying abroad in Munich) knows how to Lindy Hop. I’m a bit rusty (it’s been a year and a half), but we still managed to impress our fellow party-goers. I spent my year at Cambridge swearing I would not join a college chapel choir. A free meal and some voice lessons were not worth the commitment of two rehearsals and a service each week. Of course, immediately after arriving in Munich, I joined a church choir (also Anglican) and committed to two rehearsals and a service each week in exchange for voice lessons (and no free meals). Makes perfect sense, right?